A celebration of Jay's life will be 1 p.m. Wednesday, Jan. 20, at Esterdahl Mortuary & Crematory, 6601 38th Ave., Moline. Visitation is from noon until 1 p.m. Burial is at National Cemetery, Arsenal Island. Jay was born Dec. 20, 1917, in Macomb, son of David and Mary Katz Schaff. He married Katherine M. Snell on April 22, 1945, in St. Charles, Mo. She preceded him in death June 4, 1994. Jay earned his bachelor's degree from Western Illinois University and his master's degree from the University of Indiana. He was assistant principal at Moline High School, retiring in 1978. Jay was a Navy veteran of World War II. He was a member of the Moline Kiwanis, American Legion Post 246 and the Masonic Lodge. Survivors are son, Terry (Dee) Schaff, Scottsdale, Ariz.; granddaughter, Katie Schaff, Loyola University, Chicago; and sister, Helen Winkler, Bushnell, Ill. He was preceded in death by his parents. 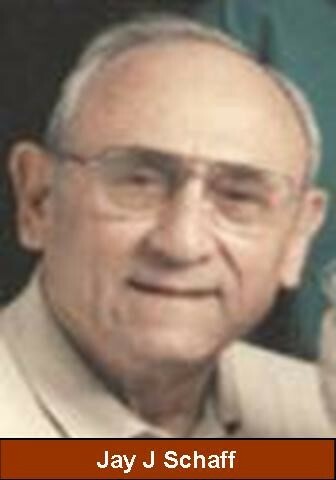 Online condolences may be expressed to Jay's family by visiting his obituary at www.esterdahlmortuary.com.